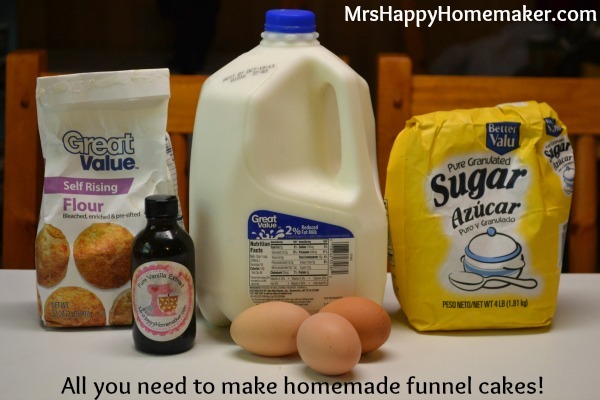 Homemade Funnel Cakes are one of the easiest & cheapest things I’ve ever made. I just don’t understand why fairs charge so much! Let me know you how! 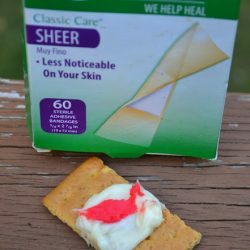 They’re so good! 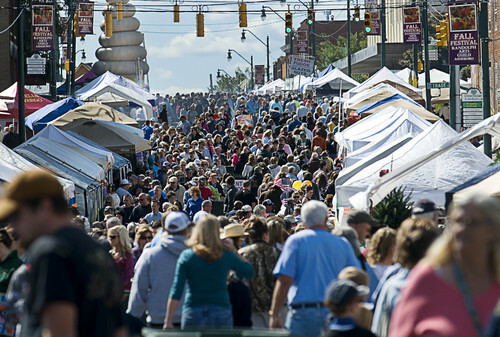 This weekend, my hometown is hosting it’s 41st annual Fall Festival. I look forward to this event all year long! The entire downtown area is blocked off, and filled with food & crafts. I love to browse through all the handmade items, sometimes purchasing things & sometimes just to get some inspiration for making some new crafts myself. My children love the tradition of going too! Usually, it’s hard prying them out of bed early on a Saturday morning – but they are up before me on the Saturday morning that the Fall Festival begins! They know I like to get there as soon as it opens… the crowds are less & parking is easier! 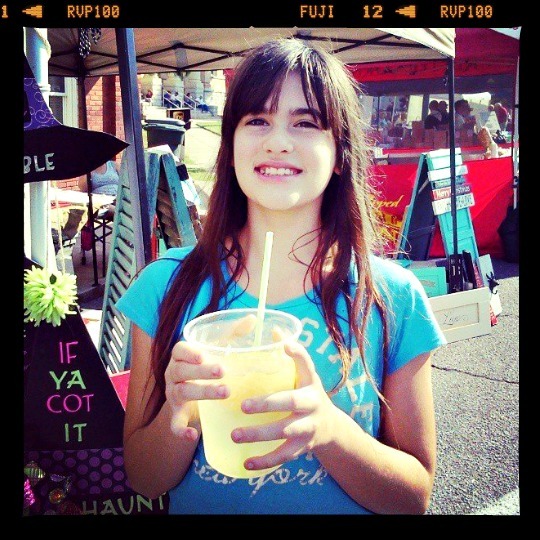 🙂 To add to the tradition, we always buy a big cup of fresh squeezed lemonade as we cruise through the festival. And this year, it was even more refreshing than usual as the temps were in the mid to high 80’s! Where’s my Fall weather at? Another ‘food tradition’ at the festival is we always purchase some ears of roasted corn from the same man every year. 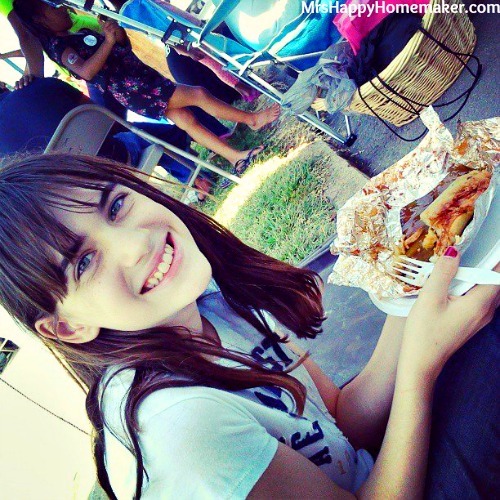 This year, my oldest daughter flubbed her nose at the roasted corn though & opted for a tamale instead. 5 tamales for $4 bucks though was a heck of a deal when it comes to festival food! If you aren’t careful at events such as festivals & fairs though, you can end up spending a pretty penny. One thing I refuse to buy at these kind of outings are funnel cakes. At the Fall Festival, the going price for just one of them was a whopping $5! Call me cheap all you want, but that’s highway robbery to me! Especially when I can go home and make up a dozen of them for less money than that! And, that’s exactly what I do! My kids know this too – and aren’t even disappointed to not get one at the festival because when I make them at home. Not only do they think mine taste way better than the ones you can buy, but they can have 2 instead of just 1! 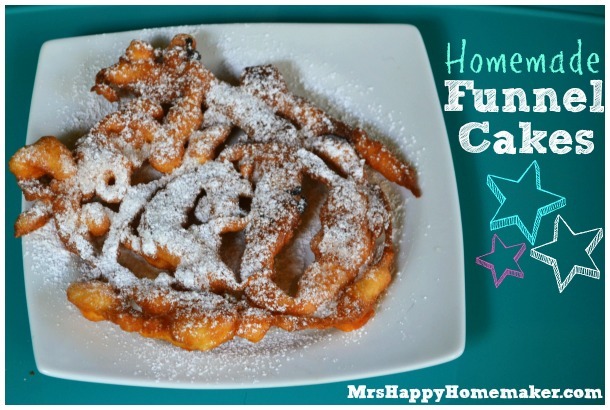 Two funnel cakes is always better than one, especially in a kids’ eyes! 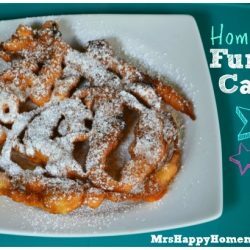 I’ve posted how to make funnel cakes once before on the Mrs, but I’ve since changed my measurements just a tad – and this time, I’ve got a photo tutorial to go along with it. 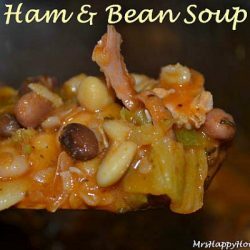 Follow along, see how easy it is! You won’t ever want to purchase them when your out & about again either. 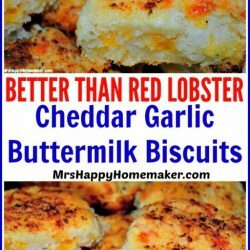 Plus, these are completely from scratch & oh-so-yummy… I’m pretty sure the ones you buy are basically just a dry mix that they combine with water. 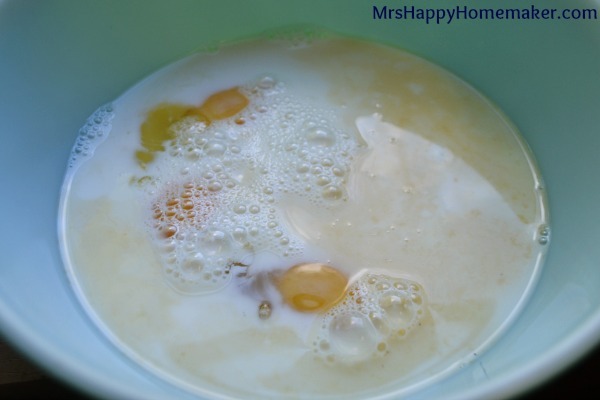 In a bowl, whisk together 3 eggs, 2 cups of milk, 1/2 cup of sugar, & a splash of vanilla extract. 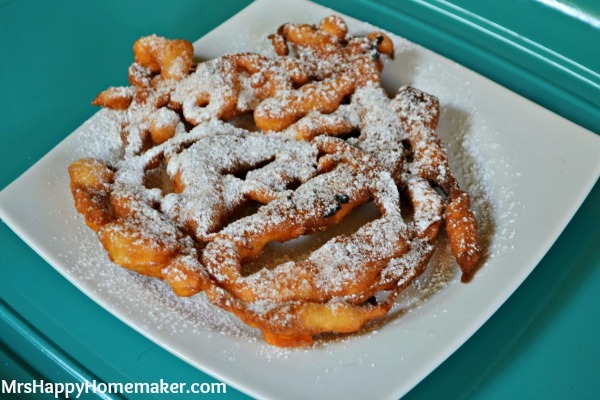 Now, the traditional way to ‘dispense’ these is through a funnel – hence the term funnel cake. If you want to take this route, scoop some batter (about a 1/2 cup or so) into a funnel, and place your finger on the pouring end until you’re over the hot oil. 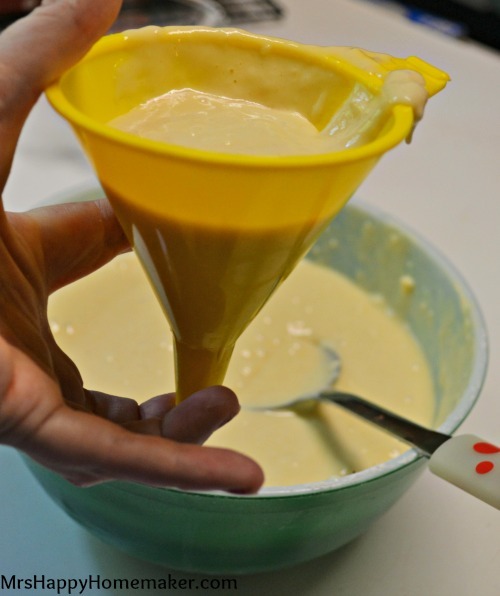 Then remove your finger, and move the funnel around the pan creating your cake. However, I don’t do it the traditional way. Sue me if you must… but I have an easier way. I simply just use a big spoon to create my funnel cakes by simply letting the batter fall off the spoon in thin lines until I’ve created my funnel cake. Like so. Fry on one side til you can see the edges turning brown, which won’t take long at all – about 1 minute or so. Flip using a spatula & tongs (using both makes it easier). Fry for an additional minute & then drain on a paper towel. Sprinkle with confectioners sugar if desired. 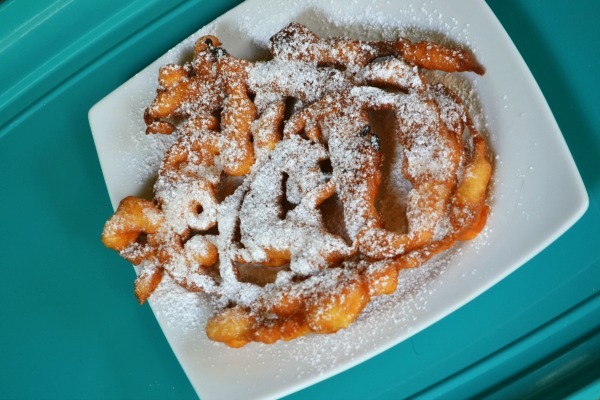 But honestly, I couldn’t picture a funnel cake any other way – got to have the confectioners sugar! Now you have a whole batch of funnel cakes for a fraction of what it costs to just purchase one! 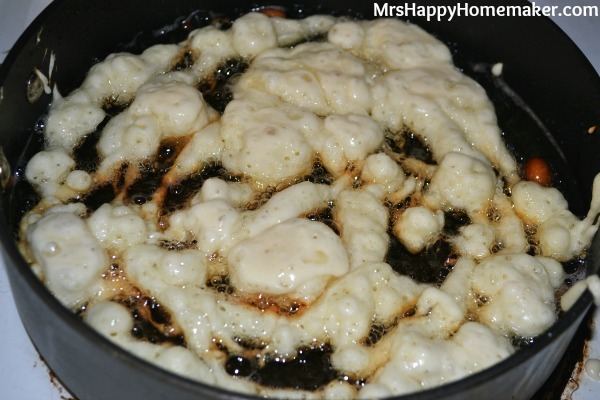 Heat the oil in a skillet, adding enough to where the oil comes up 1-2″ in the pan. 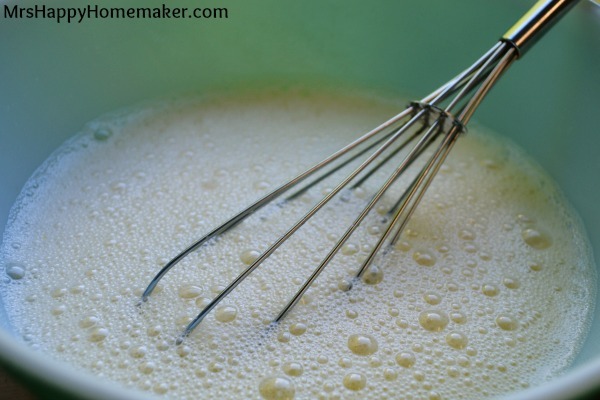 Whisk together the eggs, milk, sugar, & vanilla extract. 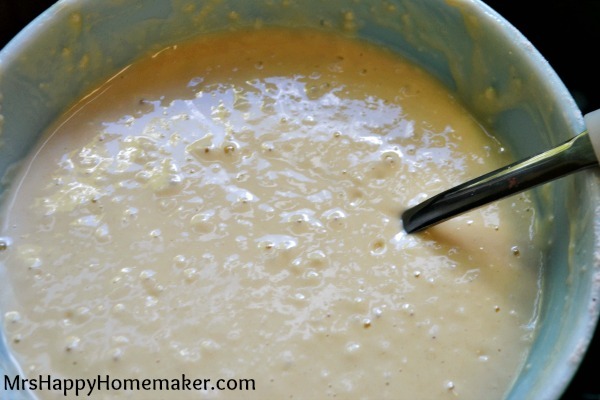 Mix in the flour. 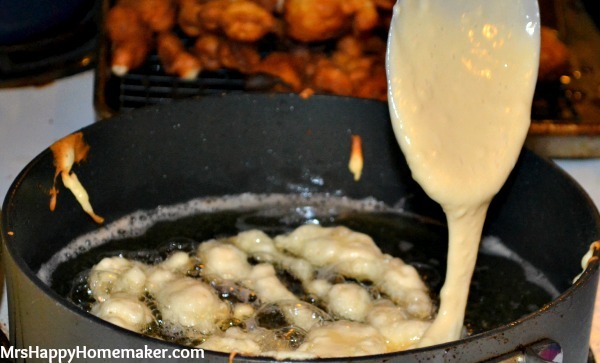 Using either a funnel or a spoon, spiral your batter in the hot oil creating your funnel cake. Fry for about 1 minute, or until the edges start to turn brown. 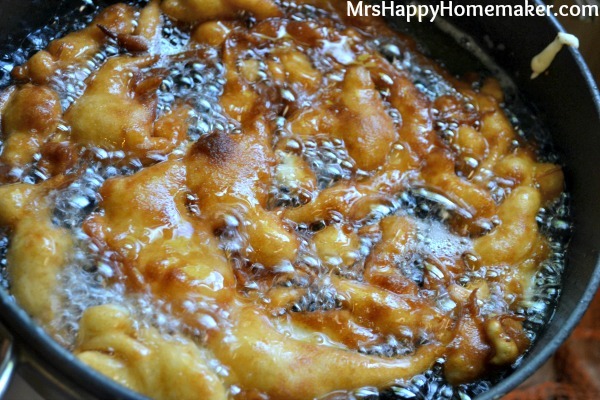 Using a spatula & tongs, flip the funnel cake. Fry for an additional minute, or until golden brown. Drain on a paper towel. Sprinkle with confectioners sugar to top.